This luxurious 2 bedroom, 2 bathroom apartment is part of the 5* Capella Marigot Bay Resort & Marina. The apartment is constructed with natural materials allowing it blend in with the stunning lush vegetation surrounding the resort. The interior has been decorated in a modern Caribbean style, featuring beautiful natural dark wood floors. It comprises of a fully equipped kitchen with state of the art Italian appliances, utility room and spacious dining area. The living room has a flat screen TV, DVD, Bose sound system, WIFI & ethernet connections. From the apartments 1000 sqft balcony you can enjoy sunbathing , al fresco dining or you can just simply enjoy a cocktail whilst looking out over the bay in your very own private Jacuzzi. The resort boasts an array of amenities and services including a marina, spa, gym, sauna, steam room, bars, shops, restaurants swimming pools, swim up bar, water sports and daily maid service. If you wish to just relax on the beach then a free ferry service is on offer to the famous sandspit beach/ La Bas beach, which is only a 1 minute ride form the resort across the bay. Each bedroom has its own spacious fully appointed bathroom with drench shower. There are a few golf courses available to play within a 30 minute drive, this can be pre-arranged or concierge will be more than happy to organise this for you. We had a great stay in this unit at the Marigot Bay Resort. The unit was very spacious and comfortable. The views overlooking the pool and the bay were beautiful. We enjoyed nightly dips in the private hot tub and the balcony was by far the largest we saw in the resort. The resort itself was great and the staff was very friendly and helpful. We booked an excellent land tour to the volcano and Pitons through the resort. Enjoyed dinner at The Grill and Julietta’s overlooking the bay. Frank was very helpful answering our questions so we could decide where to stay on our 1st trip to St Lucia. We made an excellent choice staying here. Every morning was an adventure waiting to see what mega-yacht docked out front that morning. We would highly recommend renting this unit and hope we have an opportunity to do so again in the future if our travels bring us back to beautiful St Lucia. A Peaceful and Luxurious Vacation! We enjoyed the most blissful week in March at Marigot Bay in Frank’s incredible two-bedroom condo! The unit is located directly above the beautiful pool with swim-up bar and has a breathtaking view of the bay and surrounding mountains. The unit itself was immaculate and provided plenty of space and privacy with two master suites on opposite sides of the living room and kitchen. The terrace is double the size of the other terraces at the resort and we loved relaxing in the heated jacuzzi...there are only a few units with jacuzzis at the resort and this unit appeared to be the only second story unit with a jacuzzi, which also allowed us to enjoy the bay view! Our only concern was that the resort initially gave us a unit that was not the one we booked with Frank via VRBO, and did not have all of the same features. When we contacted Frank to confirm his unit number, he was unaware that the resort had not given us his unit, and immediately contacted them to insist that we be moved to his unit immediately. He followed up with us to ensure that the move had taken place and that we were satisfied with his unit, and we hope that our review reflects just how much we loved it! 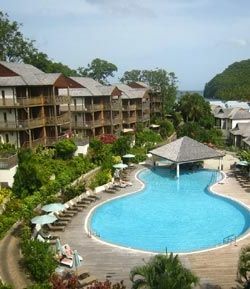 If you are looking for a peaceful and luxurious vacation in St. Lucia, then this is the apartment that you want! Thank you for taking the time to leave a review. We really value your comments. It gives me great pleasure to hear how much you enjoyed the apartment and St Lucia. We hope to welcome you back again soon. The resort marina is phenomenal! Staff is very accommodating to all of the guests requests! The unit is very large and clean! Would not hesitate to book again. Thank you for your kind review and feedback. I would welcome you and your family back again at any time. If I had to choose a negative it would be there’s not much to walk to in the area. Probably wouldnt be an issue though if our children were older (3/1). Lots of stairs too so strollers (even in town) I would not advise and would go with a baby carrier for sure. We had a wonderful week in St Lucia. This property is absolutely gorgeous! The deck is enormous, and comes with a private hot tub. Every day we woke up to a spectacular panoramic view of a beautiful bay filled by mega yachts and lush mountain green. The service in Capella Marigot Bay is impeccable, somehow all staff remembered our names too. They were extremely friendly and welcoming. We enjoyed the hotel pool, restaurants and SPA. We usually are very picky, but this apartment and the hotel really exceeded our expectations, we are so pleased that we stayed here for our lovely spring break. I am really pleased that the apartment, resort and service levels exceeded your expectations, the resort is a little bit of paradise!! We would welcome you and your family to visit us again any time in the future. Notes on prices: Prices for the properties are per week in UK Pounds and are inclusive of the St. Lucian taxes. For two weeks or more please contact 07976 609822.